Spray Pam in 9x13 glass pan. Heat sugar and butter to boiling on high. When boiling turn down and stir for 6 to 7 min. Immediately spread mixture in pan. Sprinkle choc. chips over mix and put a cookie sheet over pan to help trap heat and melt chocolate. After choc. is melted, spread and sprinkle chopped pecans over. Refrigerate until hard. **for a SUPER HEALTHY version... just use all organic choc., sugar, and butter...ha! ha! **This is a very simple recipe. 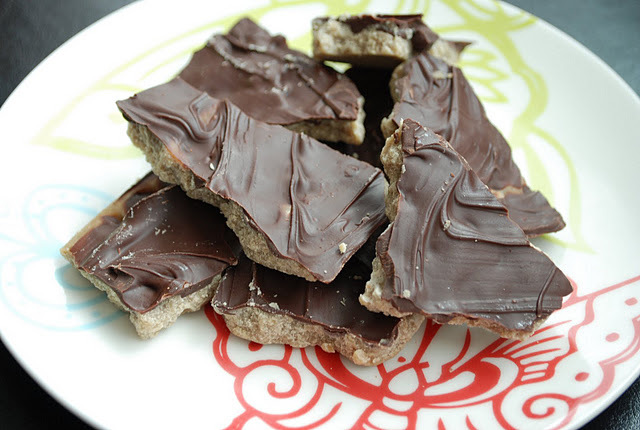 But after trying other toffee recipes, I always go back to it! There is something that I just love about this recipe. Great for holidays, or any day!